British comedy Gavin and Stacey is such a hit across the pond that it’s won multiple BAFTAs and British Comedy Awards and recently gotten a shout out from Olympic swimmer David Davies. And now that it’s come to BBC America, us Yanks finally get to see what all the fuss is about. Essentially, Gavin and Stacey is a romance about a nice boy from Essex, England (Mathew Horne), and a nice girl from Barry, Wales (Joanna Page), who fall in love and (eventually) get married. And it’s a comedy about the circle of deranged friends and relatives who orbit these twin suns of romantic bliss. Though the people who populate their world may be batty, the title couple themselves ground the show with a center of un-ironic sincerity. Their eccentricity hinges on their immediate and unshakable mutual affection–after all, what’s crazier than two strangers deciding they can’t live without one another? 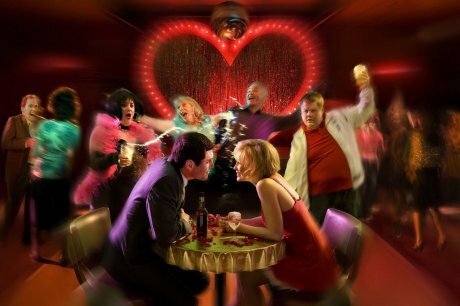 Gavin and Stacey is absurd, endearing, racy, unapologetically romantic, and simultaneously modern and old fashioned. It’s a Richard Curtis romance adapted for a post-Ricky Gervais television landscape. The fact that Horne (who, for some reason, reminds me of Torchwood‘s Owen, if Owen were a Very Nice Young Man instead of a Very Bad Boy) came from The Catherine Tate Show and Page is perhaps most recognizable from Curtis’ Love, Actually gives you a clue to the sensibility of the show. This contradictory tone is mirrored by the soundtrack, which in the first episode runs the gamut from The Libertines and The Kooks to Paolo Nutini and Lifehouse. Take BBC America’s advice and turn on your closed captioning, though, because some of the Welsh accents are a bit indecipherable to the untamed American ear. And enjoy the original in all its untainted glory while you can, because (of course) is NBC is already working on an American adaptation. Last year, the Top Gear boys tested their tractor mettle (which was inconsiderable) by planting a field destined to become biofuel. Their little gas plants are all grown up now, and they’re…diesel. Er. 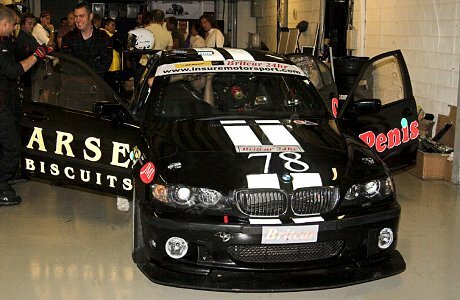 Fortunately, their fuel can be put to good use in the Britcar 24-hour endurance race. Surely Jeremy, Captain Slow, the Hamster, and the Stig will be calm and reflective after 24 hours of being exhausted and competitive, right? Right? And surely they’ll love this car as much as Hammond loved Oliver, what with the special paint job they gave it. Since the Beeb won’t let them advertise actual products, they created fake businesses Larsen’s Biscuits and Peniston Oils and painstakingly painted their “sponsors” onto the car. I’m sure they did it just so their car wouldn’t feel left out. Wasn’t that thoughtful? 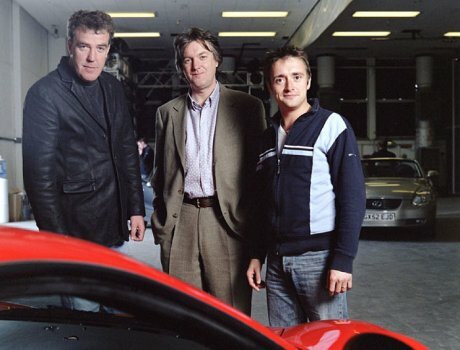 Isn’t “thoughtful” usually the word that comes to mind when you think of the Top Gear crew? Here is what I know about cars: Some of them have thingies that stick up on the back and some don’t. Some have automatic transmission and some have standard, which I’ll have to practice on again if I ever go on The Amazing Race. Almost all of them have wheels. I’m…not very into cars. All of this plus a show dog (Top Gear Dog! ), a tame race car driver known only as The Stig, and Star in a Reasonably Priced Car, a celebrity interview segment capped with said celebrity taking a timed lap in a cheap car (the times being posted for all posterity). Tonight’s star? Helen Mirren. Let me impress this upon you: tune in to Top Gear, and you’ll get to see Dame Helen Mirren–in a helmet–racing around a track in the equivalent of a Ford Focus trying to beat out competition like Ewan MacGregor and Hugh Grant. And that won’t even be the funniest part of the show. 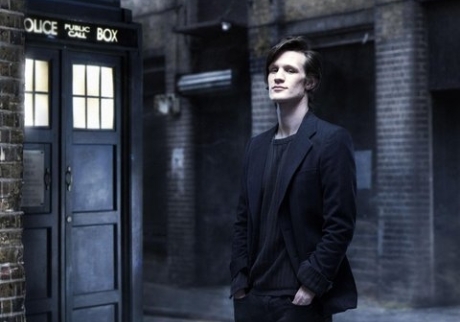 Season premiere tonight on BBC America at 8pm EST with a replay later that night at 11.